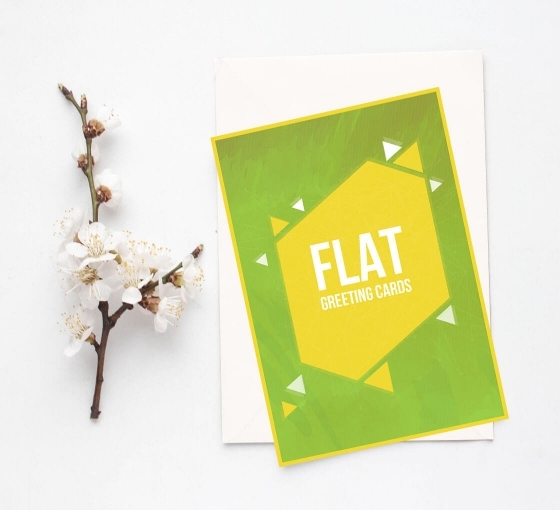 Our flat greeting cards are an ideal option for businesses that want to send their customers a greeting card in the mail. Most companies send electronic greeting cards, but those have lost their appeal. Most people have so many emails in their inbox that they do not even bother to check it. Plus, your greeting card could land in the junk folder. To ensure that your custom business greeting cards are received and read by your customers, send them in the mail. These days, people like receiving mail they can open and hold in the hands. However, not any greeting card will do. You need to send your customers high quality flat greeting cards that influence them to visit your store to purchase something. If not to buy, then to remember your name. With custom business greeting cards, you can notify customers by mail to let them know you are having a sale on a specific date. If you are hosting an event or attending a trade show, this is a great way to spread the message. You can even give the cards to your employees as a "thank you" or on holidays. Our custom business greeting cards come with envelopes as well. Upload your fabulous design via our website so we can print it on the card and send it to you. Your customers and employees will respect you even more for taking the time to do that. May be written on but testing is recommended. Ballpoint pens (oil-based ink) and permanent markers work best. Ballpoint pens (oil-based ink) and permanent markers work best. Non-glossy surface provides better writability but testing is recommended.